Rich, buttery, perfectly moist Raspberry Coffee Cake with Streusel Topping and Vanilla Glaze! Summertime breakfast just got soooo much better! Oh hey there – Welcome to the start of fresh fruit season and summertime kitchen adventures! (or you know… Tuesday….) But after a winter of terrible produce and little sunlight – I’m sooo excited to start summer baking and blogging. So today we’re kicking it off with a Raspberry Coffee Cake with Streusel Topping and Vanilla Glaze. It’s summery, buttery, filled with delicious berries, topped with crunchy cinnamon streusel, drizzled with glaze & so perfect for summertime coffee on the back deck. You’re going to love it. To be honest – I used to hate coffee cake. Not the taste, but the principle. You see – like most children I did not like coffee and cake without frosting just seemed wrong. But with time comes maturity, a love of coffee and a realization that an excuse to eat cake for breakfast can only be a good thing. So clearly – its time to put on our aprons and break down those kitchen stereotypes. Did I go too far? Ok – let’s talk the specifics about this delicious coffee/crumb cake. The cake has a not too sweet with buttery, vanilla flavor. 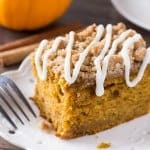 It’s moist and like any coffee cake – it has a slightly denser texture than a cake you’d frost. The perfect consistency is created by using buttermilk, sour cream & 2 eggs. I know I come back to these ingredients in so many recipes for cakes and muffins – but together they create tender, moist, perfectly soft baked goods. Making the batter takes little time – but I 100% recommend bringing your ingredients up to room temperature before getting started. The batter is very thick so ensuring the ingredients are room temperature makes it easier for mixing and getting an even consistency. 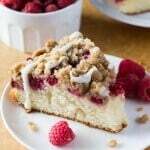 Then the batter is topped with a layer of fresh raspberries followed by a sweet, crunchy layer of streusel. We’re making the streusel by mixing cold butter with flour, sugars & a little cinnamon then crumbling it on top of the raspberries. The soft, tender consistency of the cake with the sweet crunch of the streusel definitely takes your cake to the next level. And then with a drizzle of vanilla glaze – you’re set to impress any brunch guests. Or save the entire thing for yourself…. I support either. But 100% highly recommend starting off your summertime baking with this Raspberry Coffee Cake! Rich, buttery, perfectly moist Raspberry Coffee Cake with Streusel Topping and Vanilla Glaze! So perfect for breakfast or brunch! Preheat the oven to 350F degrees. Grease a 9 inch round springform pan with butter or nonstick cooking spray and lightly flour. Set aside. Make the streusel. In a large bowl combine the flour, sugars & cinnamon used in the streusel whisking gently. Add the 1/2 cup butter cut into chunks and cut in using a pastry cutter or fork until the mixture is crumbly and similar in consistency to wet sand. Set aside. Make the cake batter. In a large bowl whisk together the flour, baking powder and salt. Set aside. In a separate large bowl using a hand-held or electric mixer beat together the butter and sugar on medium speed until fluffy (about 2 minutes). Add in the eggs and vanilla and continue beating until combined (about 30 seconds to 1 minute). Turn off the mixer and stir in the sour cream using a large wooden spoon or rubber spatula. Then turn back on the mixer to low and carefully add in about 1/2 half of the flour mixture followed by about 1/2 of the buttermilk. Repeat with the second half of the flour mixture and buttermilk until combined, scraping down the sides of the bowl using your rubber spoon or spatula as necessary until well combined. Pour/spoon the batter into the prepared pan. 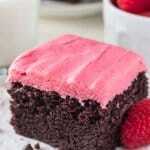 Place the raspberries on top of the cake batter to create an even layer. Then sprinkle the streusel on top of the raspberries by crumbling it in between your fingers & fists until an even layer of crumble covers the raspberries. Bake in your prepared oven for 50 to 60 minutes, or until an inserted toothpick in the center of the cake comes out clean. Gently trace around the edges of the pan with a thin knife, then allow the cake to cool fully in the pan. To make the glaze, whisk together the milk/cream, vanilla & powdered sugar until a smooth consistency is reached and no lumps remain. Add a little extra milk/cream or powdered sugar as necessary. Then when ready to serve unclamp the ring around the springform pan, cut into pieces and drizzle with glaze. Just made this recipe recently, and it’s easily the best coffee cake recipe I’ve found! I baked it in a 9×13 Pyrex instead of a springform and skipped the vanilla glaze, but it still came out great and didn’t dry out (although it didn’t last long, so maybe it would have if everyone didn’t devour it so quickly). So good!